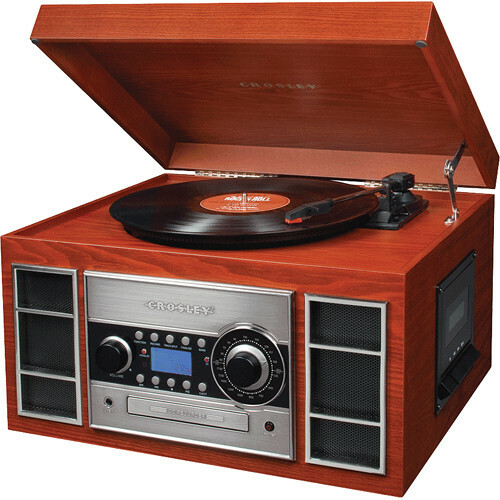 The Crosley Radio CR2413A Memory Master II (Paprika) is an all-in-one tabletop AM/FM radio and player for your records, compact discs, and cassettes that also converts your vinyl music and tapes to CDs. The system contains a USB output to your PC or Mac and includes a software suite for ripping and editing audio content. Stereo speakers are built-in, and when you don't want to use the dial controls, you can reach for the included remote. A slot-loading CD player not only plays your compact disc collection (both standard CDs and MP3 files) but it also records music to blank discs (CD-R or CD-RW) directly from a record or cassette without necessarily using your computer. If you've recorded to a CD-RW, you can erase the disc and use it again. The Memory Master II's rotary dial or remote control let you adjust the radio tuner to receive the complete spectrum of over-the-air AM and FM stations in your area. Antennas are included. You'll be able to take advantage of the Memory Master II's dynamic full-range speakers using the auxiliary input or an external device using the auxiliary output. Control the CD player/recorder and radio from across the room as well as EQ settings and volume using the 36-button remote. Box Dimensions (LxWxH) 21.5 x 17.0 x 13.5"
CR2413A Memory Master II (Paprika) is rated 3.0 out of 5 by 2. Rated 5 out of 5 by marie1o22 from Love it!! It's better than I thought it would be. I'm not disappointed at all. Can you dub a CDs? A slot-loading CD player not only plays your compact disc collection (both standard CDs and MP3 files) but it also records music to blank discs (CD-R or CD-RW) directly from a record or cassette without necessarily using your computer. If you've recorded to a CD-RW, you can erase the disc and use it again. The system contains a USB output to your PC or Mac and includes a software suite for ripping and editing audio content (including CD's). what type of battery does the remote control take?